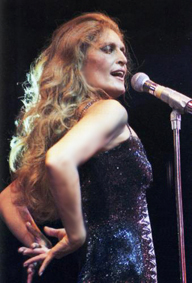 Every day of my life, I find inspiration in the voice and persona of Dalida. Elle est mon reve defendu. People gather outside her house in Montmartre and dream of what it's like inside...But I'll bet Dalida wanted out more than anyone ever wanted in. A walk to the bakery, window shopping, anything; all that we (the anonymous masses) take for granted. Though I've never been one for celebrity, Dalida touches me in a very deep and profound way...She will forevermore be in my heart (as she is with so many others) as I navigate my anonymous life. hi thank you for giving me the chance to write something about how much i love Dalida and how much i love listening to her music , first of all Dalida used to live in Shubra ,cairo,Egypt and this is where i was born too ,but i live in the U.S.A right now , i listen to Dalida every day she became a part of my day ,and my favorite song for dalida is love in porto fino ,thank you again and dalida will live in our heart's forever because she still here in our heart's and she will be till we die ,best wishes ,sayed. had the record and took it to a big holiday shindig where they knew Dalida was to be and asked her to sign it. Just this past new years eve-I was cleaning my apartment and found the recording . Of all days !Id like to think that Dalida was sending good wishes.Back at you ,Dalida - andto us all ! bonjour a vous,je suis francais,apres avoir vecu 6 ans en Afrique et maintenant en Floride,je ne peux voyager sans les cd's de Dalida,ils m'apportent reconfort et joie de vivre.Mon reve a toujours ete de renconter mon idole,faute de cela ces cd,s sont un peu,une partie d'elle,dernierement,dans un club a miami,j'ai assiste a un spectacle ou l'on imitait,Celine Dion,Cher,et a ma plus grande surprise Dalida,ce n'etait pas perfait, mais de voir qu'elle faisait partie du recital de ces artistes,ma fait un pincement au coeur. "Dalida For Ever"il n'y a aucun doute. Merci,pour ce site,et pour ces fabuleuses compilations.Continuez a nous faire vivre de telles emotions.A tres bientot Frederic. In May of 1997, I traveled to Paris, and while shopping in a local receord store, I heard the beautiful vocie of Dalida. She just reached in and touched my heart. I just to get to purchase one of her CD's, since then, I have every CD (over 20) and I an now collecting her old albums, 45's and magazines appearances. She has cast her magic spell on me. Dalida was a true artist, she felt what she sang and always gives of herself to her fans. She truly is a legend, gone but certainly not forgotten. Her music will live forever, as it is timeless. Every time I play a Dalida song, it can make me happy, sad, sing along or just feel like dancing. Thank you Dalida for all the joy you've given me and the world.